100% preshrunk cotton, deluxe 30-singles SoftStyle yarns, double-needle stitched sleeves and bottom hem. Feminine ½" rib knit collar, seamless double needle collar, hemmed cuffs, side-seam construction with stylish tapered cut. 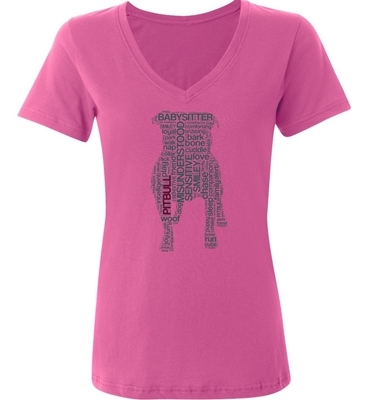 Color is azalea with a pit bull design made up of words that describe how wonderful a pit bull is.